India has always been predominantly a Chai (Tea) drinking nation. Coffee has been only moderately popular in some southern states, other than that it has been Chai (Hindi term for Tea), Chahaa (Marathi term for Tea), cutting (Mumbai term for half tea cup), maramari (another popular term from western India for tea) all the way!However, there has been a sudden change in this trend with coffee becoming more and more popular in recent times especially among the younger population. The roadside Chai (Tea) thelas (shops) outside colleges and offices have been replaced by hip coffee joints like Barista and Café Coffee Day. The Chai (tea) that used to cost couple of rupees (5 cents) is replaced by coffee costing something like Rs. 100 ($2.50). New Delhi-based Barista Coffee Company opened its first "coffee bar" in India four years ago. Today it operates 130 cafes around the country, which bear an uncanny resemblance to Starbucks. The company is quick to dismiss any comparisons. "Our inspiration was the traditional Italian Espresso bars where the idea is to create a 'home away from home," said Brotin Banerjee, vice president of marketing with Barista. 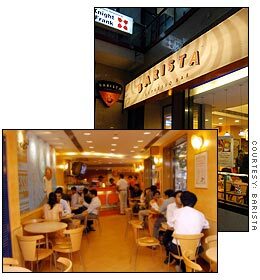 India's Barista cafes offer similar gourmet coffee drinks to Starbucks and Wi-Fi access in a handful of locations.Barista's menu features everything from a latte to cappuccino, caramel cafe, cafe mocha, flavored coffee and deserts like brownies and cakes. Regular patrons at Barista are students and young professionals 18 to 35 years old.